1. Upload the plugin files to the `/wp-content/plugins/lead-magnets` directory, or install the plugin through the WordPress plugins screen directly. 3. On Add/Edit post or page screens, in the WordPress Visual Editor you are now able to see the Lead Magnets shortcode button. These are the shortcodes that plugin uses to display the link and the popup, containing your subscription form. The 1st shortcode adds background color to the Lead Magnet link. Here you have to adjust the text of the link. You can include the link, containing your CTA unlimited times throughout your post/page. 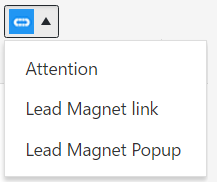 Each added link will trigger the Lead Magnet popup. Here you can also adjust text of the title, subtitle, spam statement and the close button. On the place of INSERT THE SHORTCODE FOR YOUR NEWSLETTER FORM HERE, you have to insert the shortcode of your email subscription form. This plugin works well with MailPoet Newsletters. If you use another newsletter plugin, you might have to add additional CSS to your theme, if you experience some problems with the display of the subscription form.